After a second trial ended in a mistrial due to jury deadlock late last year, a judge has now granted a motion of acquittal filed by defense attorneys to dismiss the case against Alabama police officer Eric Parker, who stood accused of using excessive force in his arrest of an elderly Indian grandfather in February of last year. 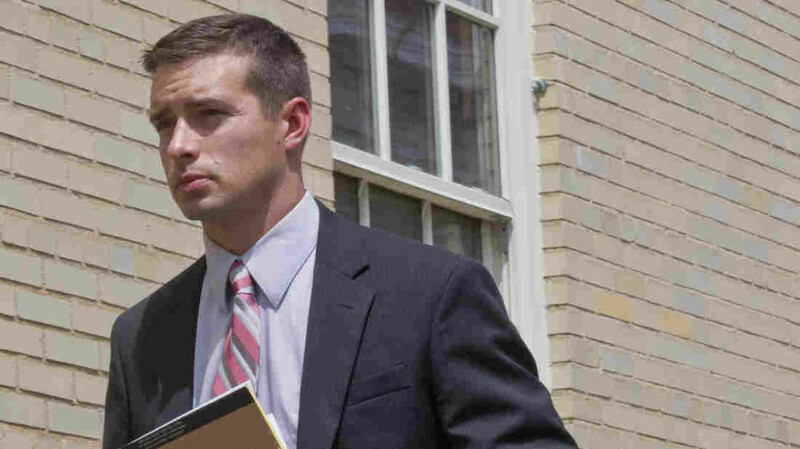 Prosecutors had been seeking a third trial against the police officer. Sureshbhai Patel, who was 57 at the time of the attack and who had just arrived in the United States to help care for his infant grandchild, was walking in the early morning of February 6, 2015, when he was approached by two police officers including Officer Parker. Police were responding to a call of a suspicious “skinny Black guy” in the area. Patel, who doesn’t speak much English, was detained and being handcuffed when dashcam video (after the jump) shows Parker suddenly slamming an otherwise cooperative and non-violent Patel to the pavement. The injury left the elderly man permanently paralyzed and reliant on a walker for mobility. Stills from the assault on Spring Valley High School student last week by South Carolina Sheriff’s Deputy Ben Fields (photo credit: AP). An unarmed 16-year-old schoolgirl who refuses to put away her cellphone does not deserve being grabbed by the neck and brutally slammed to the ground by a trained police officer. I repeat: an unarmed 16-year-old schoolgirl who refuses to put away her cellphone does not deserve being grabbed by the neck and brutally slammed to the ground by a trained police officer. 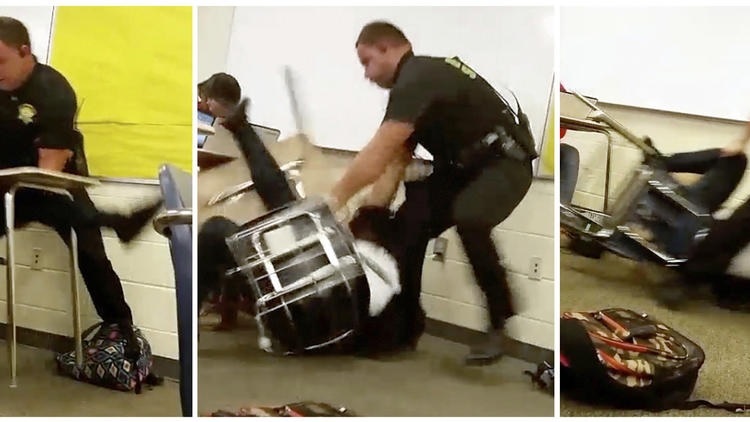 Last week, 16-year-old Shakara — a student at Spring Valley High School — was seen on cellphone video being thrown to the floor of her math classroom by South Carolina Sheriff’s Deputy Ben Fields. Cellphone video shows that Shakara was seated at her desk and making no sudden moves immediately prior to the violent assault where Fields grabbed Shakara from behind by her neck, and flipped her over so suddenly that the desk she was seated in overturned with her, and then bodily drags her out of the tangle of plastic and metal to lie prone on the classroom floor (video embedded after the jump). Already, social justice activists have rightfully identified the incident as yet another example of excessive police force targeting a Black body for unnecessary and unprovoked violence. There is nothing a seated, unarmed, and non-violent teenager could do that would justify this kind of brutal assault. 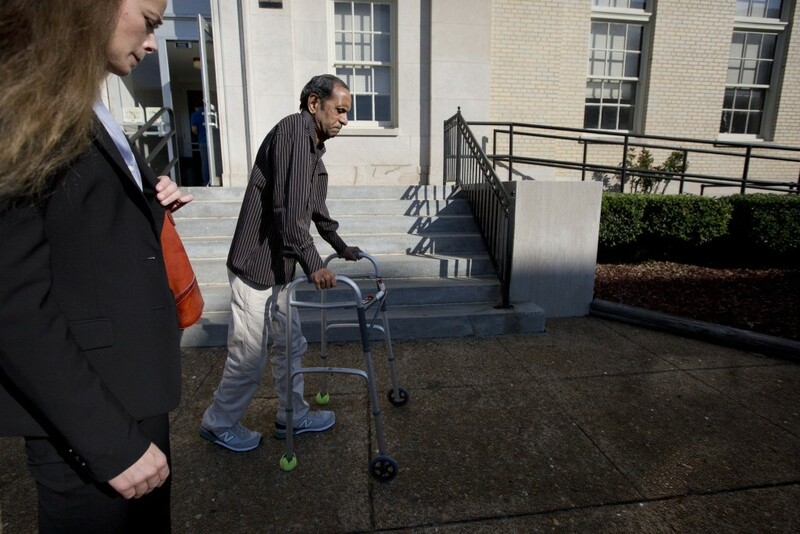 58-year-old Sureshbhai Patel was out for a morning walk this February in the neighbourhood where his son lives, when he was stopped by Alabama police officer Eric Parker. Parker was responding to a 911 call about a “suspicious” “skinny Black guy” in the neighbourhood. Dashcam video shows that within minutes of Parker confronting Patel, the police officer senselessly and violently throws Patel to the ground, leaving the elderly man permanently paralyzed (video after the jump). Parker was charged with excessive police force over the summer. However, last month that first trial ended in a mistrial due to a hung jury: 10 male jury members — none Black — voted to acquit, while the lone hold-outs were the jury’s sole two Black women members. Vishavjit Singh, creator of Sikhtoons, has created a cartoon expression of our collective outrage with regard to the recent apparently hate-motivated assaults of Sikh and Indian American men. 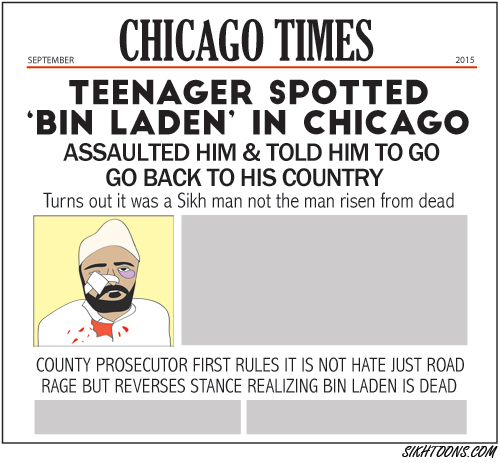 The cartoon above references the September 8th, 2015 attack on 53-year-old Inderjit Singh Mukker by a teenager who allegedly called Mukker “terrorist” and “bin Laden” before repeatedly punching the older man in the face; Mukker was hospitalized with a fractured cheek, and multiple lacerations and contusions. Police originally investigated the assault as a hate crime. On Friday, the DuPage County state’s attorney announced that the incident was mere road rage, and that they were declining to prosecute the teenaged suspect for a hate crime. This morning, the state’s attorney reversed that decision and added one count of committing a hate crime, citing “new evidence” in the change of heart. Singh also produced a second cartoon this week, referencing the recent mistrial declared in the federal civil rights case against Alabama police officer Eric Parker.